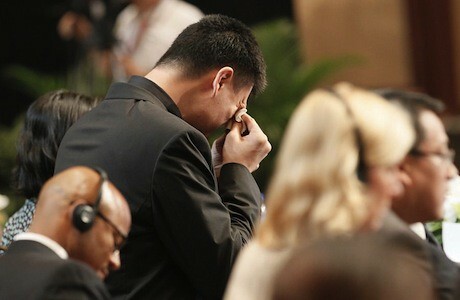 Yao Ming made it official today in Shanghai today that he is retiring. You can read the transcript below, and check out all the photos from the press conference by clicking here. 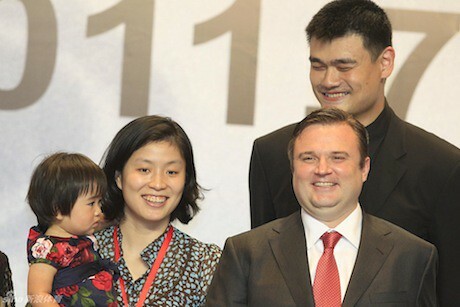 In a surprising twist given the strictness from the NBA regarding teams communicating with its players during the lockout, Houston Rockets GM Daryl Morey attended the press conference. 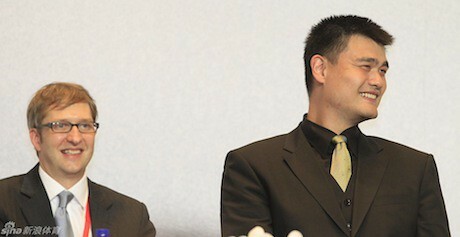 There was speculation that even in retirement, the Rockets could not speak with Yao, even after he officially retired. It’s good to see the NBA lightened up a bit for this important occasion, with even David Stern wishing Yao well through a statement. Esteemed Director Li Yuyi, distinguished guests, friends in the media. Today is an important day for me. It is a day of special significance for both my past professional career and future endeavors. At the end of last year, I once again had a stress fracture in my left foot and had to sit out of basketball. Since then, like many friends who cared about me, I waited and hoped that I could return. It was also a frustrating period, many thoughts crossed my mind. Today, I am ready to announce to everyone my decision: I will end my athletic career and formally retire from the game of basketball. At this moment, looking towards the future and looking back through the past, my heart is full of gratitude. Through our source Raymond in China, we have learned that Erik Zhang Mingji of “Team Yao” said today that Yao Ming has not yet decided to retire. In addition, Lin Dalong, a Houston Rockets marketing manager who works in China, stated in an interview with the Xinhua News Agency said that the Houston Rockets had not received formal notice from Yao Ming or Team Yao about his retirement. So there is a possibility that Adrian Wojnarowski of Yahoo Sports, who broke the story earlier today, could be wrong. If so, this could be one of the most embarrassingly incorrect sports stories we have seen in a long time since all of the news networks and social media have been buzzing today about Yao’s alleged retirement today.